Can we imagine a five to seven consecutive days without our smart phones? It’s really very tough to imagine. With the progress of technology smart phones has come up with so many facilities that we are now very much dependent on it. It helps us to be connected with the whole world just sitting in our drawing room and also bed rooms. Most of the people love their smart phones so much as like it’s their beloved, we don’t share our phones with anyone, and we are reluctant to keep it away from us for long time. It is said that “too much anything is not good”, having too much addiction and use causes lots of problems also, we should be careful about all these, apart from road accidents while crossing the roads talking in cell phones and other problems, there is one more problem which many of us suffering from. 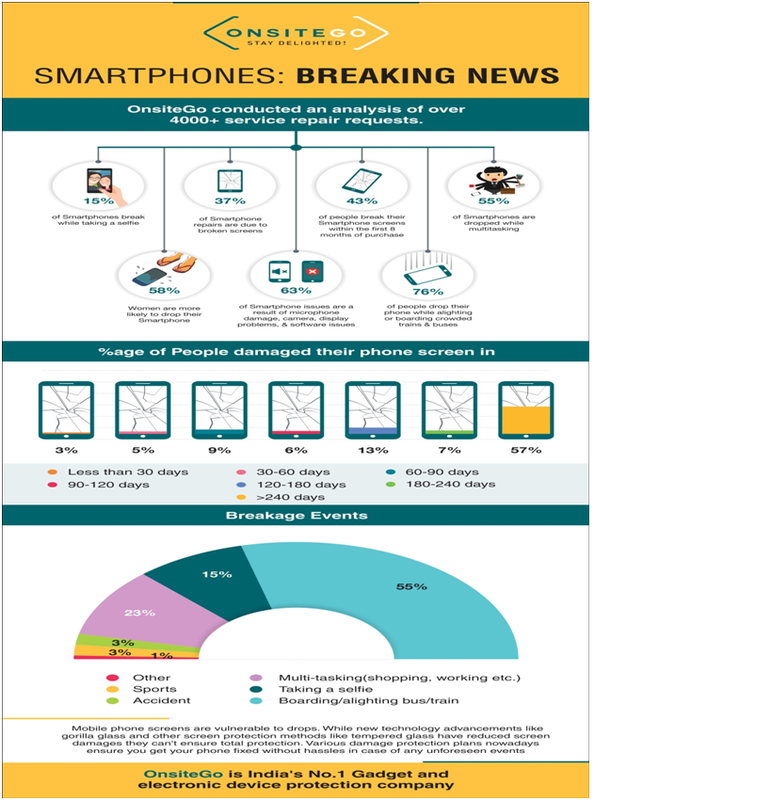 There is a data revealed by OnsiteGo, India’s No 1 gadget and electronic device Protection Company. It is said in the data that Chatting on mobiles while boarding trains, buses and multi-tasking emerge as main reasons for people breaking their phones. According to the data, taking selfies accounted for a significant number of drops. About 600 phones (about 15%) were broken while the user was clicking a selfie. An analysis of over 4000+ repair requests over a period of one year revealed that using mobile phones while alighting or boarding crowed buses or trains is un-cool and downright risky. 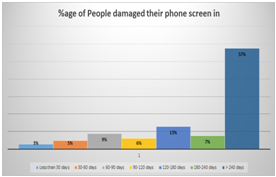 A large majority of about 3000 (76%) people have dropped and broken their mobile phones while using them at such times. According to OnsiteGo, about 4000+ requests were received by the company from across the country to repair mobile devices. The data was analyzed to spot trends in usage that could be used to spread awareness among people and help them reduce loss due to breakage. Data also shows that younger women may tend to be more butterfingered than men while handling their phones. 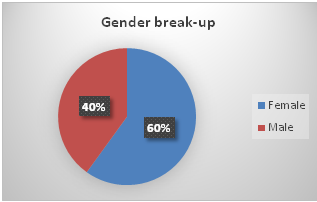 · Women tend drop their phones more often than men (58%). · Most people drop their phones while commuting. Talking on mobiles while alighting or boarding crowded trains, buses main reasons for dropping and breaking their phones (76%). 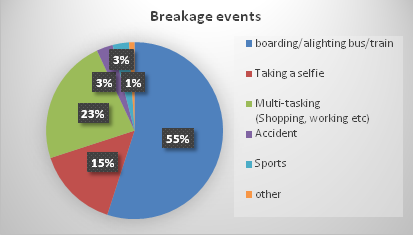 · Multitasking also cited as one of the reasons for dropping phones (55%). · Selfie drops also account for a significant number of phone breakages. (15%). · More than 50% of people tend to break their smart phone screens within 8 months of buying a new smart phone. The data showed that about 2400 people (about 60%) comprised female users out of which a majority (about 70%) was in the age bracket of 18 to 25 years. It was also found that broken screens comprised the largest category to be grouped under repairs. About 1600 (37%) were attributed to broken screens. The other issues included speaker defects, microphone damage, camera, display problems, software issues and others which were fragmented across the remaining 63%. Of these about 576 (36%) customers had broken screens within six months of purchase. Interestingly about 128 (8%) reported screen damage within the two months of ownership going up to 272 (17%) within 3 months of purchase. The numbers were found to increase exponentially after 3 months indicating that no matter how careful people are with their smart phones, breaking your Smartphone screen is almost inevitable. The numbers drastically go up as high as 912 (57%) after 8 months of purchase. Mobile phone screens are vulnerable to drops. While new technology advancements like gorilla glass and other screen protection methods like tempered glass have reduced screen damages they can't ensure total protection. It is therefore wise to opt for a damage protection plan during purchase which ensures you get your phone fixed without hassles in case of any such unfortunate event. You can choose and activate a damage protection pack for your phone during the time of purchase as a panacea for gadget troubles. Under a Damage Protection plan you will get an extensive coverage for physical and liquid damage to mobile screens as well as touch pads. A damage protection pack on your phone can prove to be a big boon in emergencies. Be sure to choose a service provider that will collect your phone, repair it and drop it back at your doorstep. You can buy a damage protection pack online as well. OnsiteGo and a few others offer such services. There are options such as “no questions asked” program offering service whether the damage is accidental or not. And if your phone is beyond repair, some promise replacement for free, so you are sorted. Most Screen Protection plans cover any damage caused to the phone or tablet’s display, be it cracked, broken or shattered display, while the Damage Protection plans cover physical or liquid damage during the first year of ownership of the product, something that manufacturers don’t currently provide.